Entrance hall: with a console table and plenty of space for coats and boots. Kitchen/dining/sitting area: superb uninterrupted views across the marshes and out to sea from this open plan area. Kitchen: well-equipped with integral appliances which include a dishwasher, double electric oven, halogen hob, fridge and freezer. There is a separate utility room: with a washing machine and a tumble dryer, plus a second fridge/freezer. Sitting room: comfortably furnished room with an ornamental fireplace (please note that this is non-working), two sofas, an armchair, flatscreen TV with BT YouView and a DVD player. There is the advantage of unlimited Wifi for guests to enjoy whilst staying. The stairs are not steep and there is a handrail. There is a landing with chair positioned to enjoy the lovely seaviews. Bedroom 2: a lovely light and airy room with superb coastal views. Beautifully presented with a king-size bed, bedside tables and lamps, walk-in wardrobe, chair, TV. There is a good-sized dressing room which would be perfect for a baby to sleep in, with a travel cot available if required. En-suite bathroom: bath with shower mixer taps, separate walk-in shower, hand basin, heated towel rail. Bedroom 3: another well-presented room with a king-size bed, bedside tables and lamps, chest of drawers, dressing table, built-in wardrobe and a TV. Bedroom 4: has twin beds (2'6"), bedside table and lamp, chest of drawers and a TV. Family Bathroom: Bath with shower mixer taps, separate walk-in shower, hand basin, heated towel rail and WC. The gentle staircase leads up to the top floor containing a wonderful light and spacious master bedroom suite with stunning views. Bedroom 1: superb room with an enormous emperor size bed, bedside tables and lamps, chaise longue, dressing table, large chest of drawers, TV, telescope to enjoy the fabulous views. En-suite bathroom: fantastic large bathroom with bath with shower mixer taps, separate walk-in shower, his and hers basins, heated towel tail and WC. There is plenty of parking in shingled driveway at the front of the house. There is a pedestrian gate leading to the rear garden which is fully enclosed and backs on to the marshes which lead out to the sea. There is a paved area with garden furniture and a charcoal barbecue. 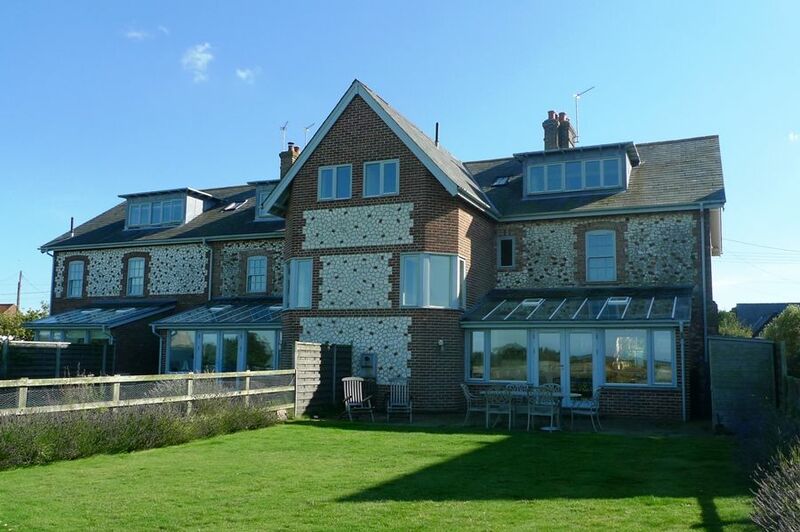 It is only minutes walk to the coastal path which leads across the marshes and out to the gorgeous sandy beach. Also within a short walk are two excellent places to eat and drink: Titchwell Manor and Briarfields. Please note that this owner does not charge for dogs.